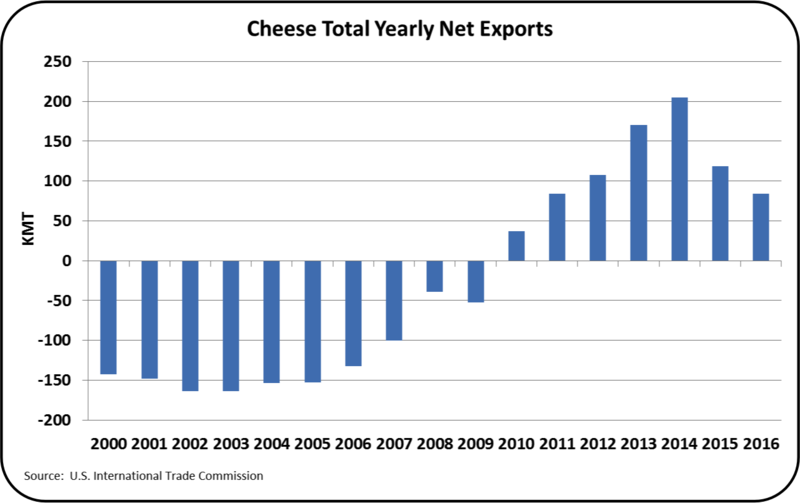 Cheese exports, in metric tons, have increased in the last nine months. By December, exports were above the prior two years. This certainly shows a healthy trend. Where did these exports go? 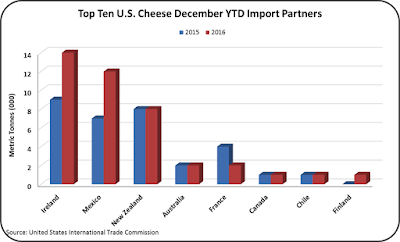 Mexico is by far the best market for U.S. cheese accounting for about 30% of U.S. exports. Mexico imports were near 2015 levels, but most other importing countries were lower. 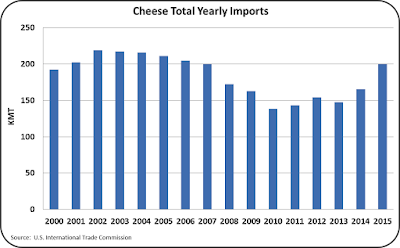 The lower imports of U.S. produce cheese were caused by lower prices from Oceania and Europe. During 2016, imports have risen even faster than exports. In December imports were near record levels. The imports came from a lot of different countries with big increases over 2015 coming from Ireland and Mexico. 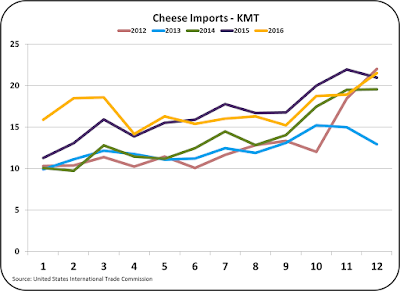 With the Mexican peso continuing to fall against the USD, and with NAFTA providing open borders, cheese imports in 2017 could continue to have very strong growth. 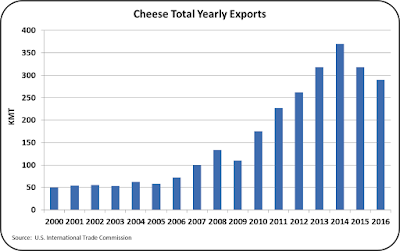 Could cheese production increasingly cross the border like automobile production has? See the September18, 2016 post for a review of free trade agreements. 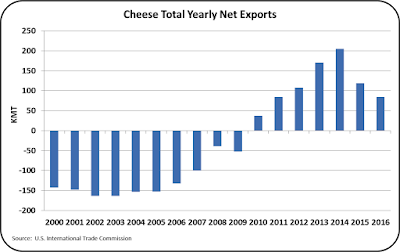 In total, net exports (exports minus imports) of cheese were flat. 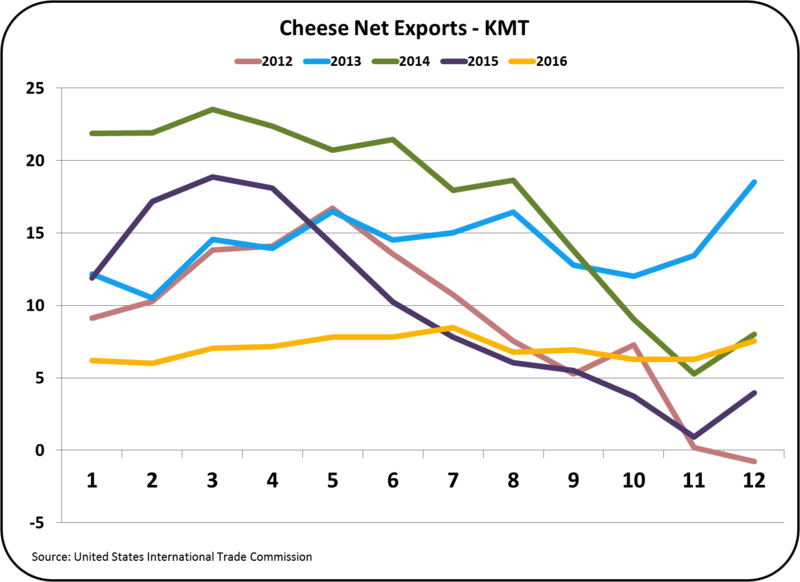 If net exports remain flat, they will make up a decreasing percentage of U.S. cheese production. Cheese pricing hit a 2016 high in August, and has declined somewhat since then. 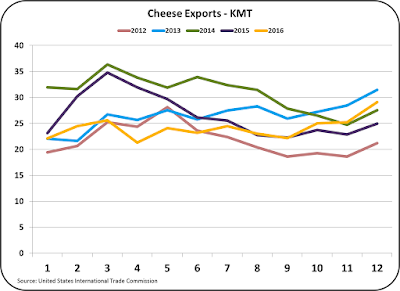 The NASS price of cheese has not fallen as much as the export price of cheese, but as the USD gains strength versus other currencies, and inventories grow (see prior post) the U.S. price of cheese may show some decline. 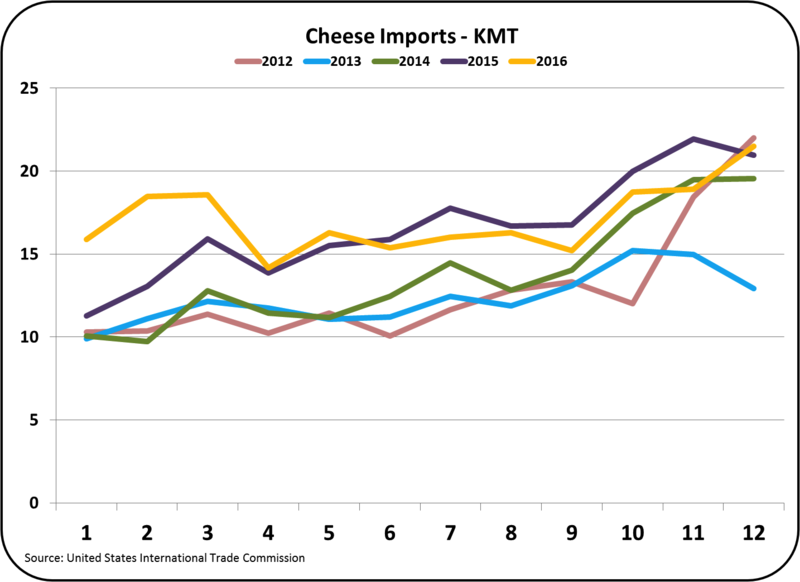 To date, the futures market is showing a slight increase in cheese prices in 2017. 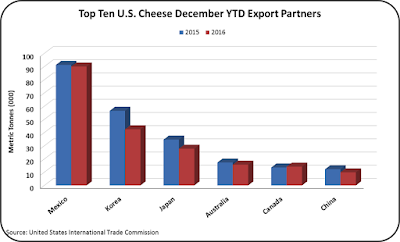 In reviewing full year analytics, the U.S. became a net exporter of cheese in 2010. 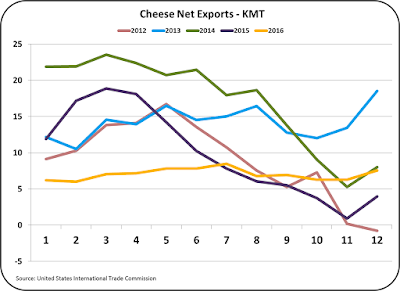 Net cheese exports reached a high in 2014, and have taken significant declines in 2015 and 2016. Cheese exports increased nicely from 2000 to 2014, but have since decreased. The creeping rise in imports shown in the second chart may be the start of a trend. In the past, a lot of the cheese imports have been specialty cheeses primarily from France and Italy. 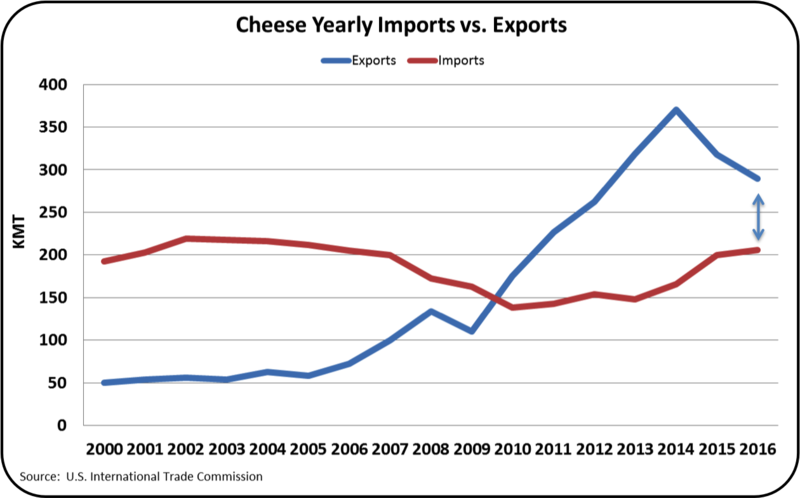 The U.S. is now seeing imports of commodity cheeses from other sources. 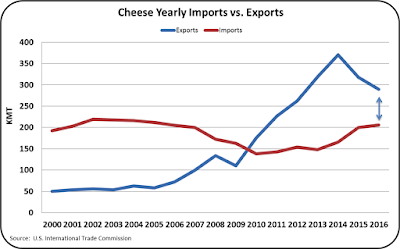 The chart below is another view of the export/import relationship for cheese. As the line for exports declines, and the line for imports grows, the net difference begins to close. If the lines meet, there are zero net exports. After significant gains from 2005 to 2014, the gap has closed significantly in 2015 and 2016. 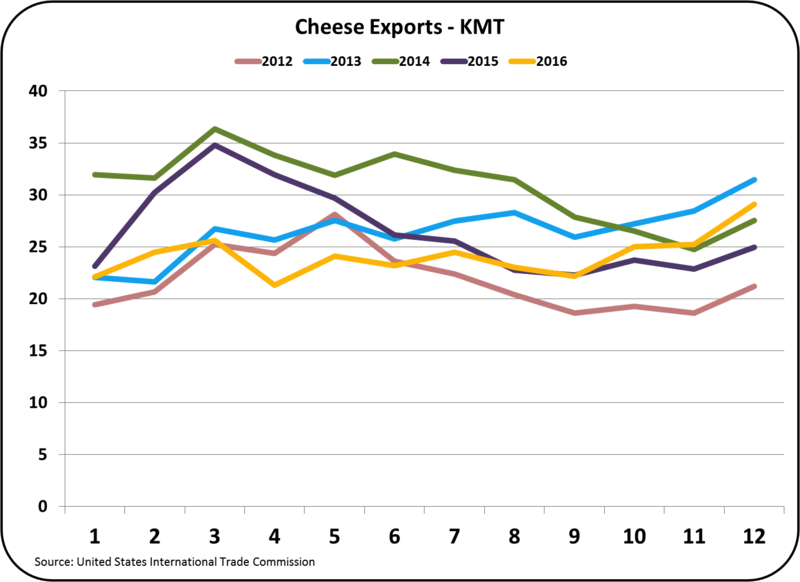 Cheese exports as a percentage of production decreased to 5.2% in 2016, compared to 6% in 2014. In 2016, 368 KMT were exported vs. 317 KMT in 2016, a decline of 51 KMT. However, U.S. production of cheese has continued to grow and inventories are growing (See the February 7, 2017 post). Whey is a co-product of cheese manufacturing. Some of the whey is dried which makes it a suitable product for shipping and export. 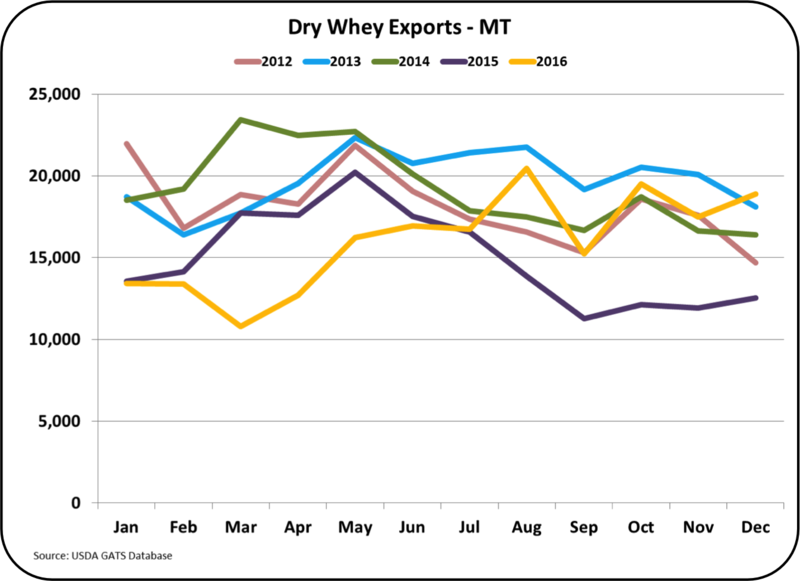 In 2016, 44% of dry whey was exported, up from 41% in 2015. 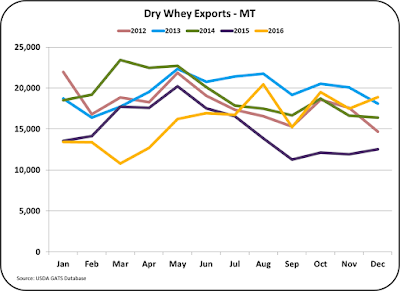 The volume of dry whey exported increased for 172 KMT in 2015 to 192 KMT in 2016. The increase was lead by significant increases in exports to China. Dry whey prices have increased in 2016 beginning at $.24 per lb. and ending the year at $.40 per lb. January 2017 pricing continued to climb to $.44 per lb. The dry whey price is the basis for pricing Other Solids in the component pricing formulas and this increase is a significant boost for the Class III milk price. There is very little dry whey imported into the U.S.
Exports of cheese and dry whey in 2016 were on an upward movement. The increase in cheese imports is troubling for the U.S. dairy industry. Butter and NDM 2016 exports and imports will be covered in a upcoming post to this blog. The other impactful change in the U.S. dairy industry is the possible acceptance of the USDA proposal to make California a Federal Milk Marketing Order (See the February 12 post to this blog for more details). A meeting with producers and other interested parties will be held on February 22. Following the February 22 meeting, additional information will covered in this blog.